Keiko, koi ponds and bad wiring. The last couple of weekends have been a big amount of hard physical work in very different ways. Last weekend I went over for a training session in Cambridge with Jackson Sensei and Gowland sensei in the morning and had a quite different session. It’s a little session that Matt has put together incorporating all 3 of the joined clubs in the area. The format was really simple. Warm up, three lots of suburi, one round of kirikaiesh then jiegeiko for the rest of the session and a full rotation. Turn out was good, around 14 of us so it took a while to do a full rotation. Eric was doing jigeiko, ichi-gomi-geiko and then ippon shobu. I started and finished with him so I did it twice. Then just to finish off, we did one more round of kirikaiesh. Now I’d hit that point during my last lot of ichi-gomi-geiko where my body was beginning to flag somewhat. Not really surprising seeing as I’d done a full round of 15 bouts of gigeiko. So when Eric called at the end to do one last round of kirikaiesh, I was really not all there but threw everything I had left into it. As I’ve mentioned before, bad motodachi can really make kirikaiesh crap to do, but up against someone of Eric’s level it’s a pleasure. My first cut was spot on and my saiu-men cuts were quick and on target. As I made my distance back for the next 10 cuts, I felt myself scrape the bottom of my energy reserves and I began to slow down. The first 5 cuts were really slow, but I dragged a bit more out with louder and stronger kiai speeding up towards the end. Making distance, I did my last men cut and skipped down the side of his men. Damn. We finish and Eric tells us not to take our men off yet, only he is taking his off. ‘What now’, we all think. Jackson sensei, takes up a place on one side of the dojo and we all have to line up on the other, and do ippon shobu. Nice. All in all it was a really good training session. Doing that much jigeko really allows you to settle down and concentrate, get into the zone so to speak. This weekend just gone was a little different. 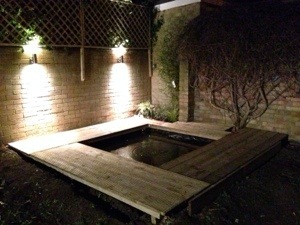 I’ve been building a koi pond in the garden and it’s the first bit of serious garden landscaping I’ve done. Along with digging the thing, 6ft square and 2m deep, I’ve lined it, filled it and put decking all round. This has also been complicated by the completely dodgy wiring going to my garage. 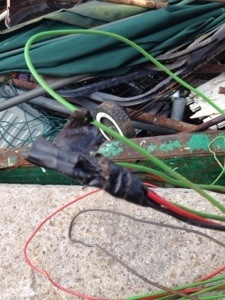 To cut a long story short, in trying to fit the pond pump I found some pretty serious wiring issues going to my garage meaning that I had to lay a complete new bit of armoured cable and install a new RCD unit. Saturday I worked solidly from 9am to 6pm and finally got it all ready for the fish, kindly donated by my father in law. I felt a little connection there after the long hours of work going into the pond when I went outside after dark, turned on the outside lights and relax. Mokouso. As with any activity, I’m beginning to understand the nature of mushin a little more. While working on the majority of my projects, be they work or home, I end up mot really thinking about doing it because I have enough experience that I no longer have to actively engage my mind to the task. When I do this is as Yagyu Munrnori describes as a stop in your mind. You are doing a task or learning something and when you have to think about it, you stop for an instant or even longer. As you get better at things these things no longer occur and you simply do the things you have been trained to do without thought. I have lots to think about round the pond now.